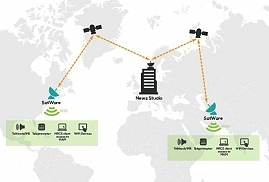 Vislink's SatWare helps TV journalists report from remote areas. Hemel Hempstead, September 2016: With broadcasters facing an increased demand for worldwide content, but with inefficient infrastructure hampering their ability to deliver high quality video from different corners of the globe, Vislink has launched a new addition to its SATCOM portfolio. The leading global technology business, which specializes in the wireless capture, delivery and management of high quality live video, has launched SatWare to easily extend studio workflows to the field. It allows reporters from around the world to work together, sharing files and video content as seamlessly as if they were in the studio together. The SatWare computing platform delivers IP services across continents whilst making efficient use of satellite bandwidth. This means that file based workflow, data and voice communications can easily be accessed by the remote reporter over a Wi-Fi connection to the Vislink satellite terminal of their choice.